Aljona Savchenko and Bruno Massot debuted their new short program – a Lindy Hop to “That Man” – at Yuna Kim’s “All That Skate” shows in South Korea in June. 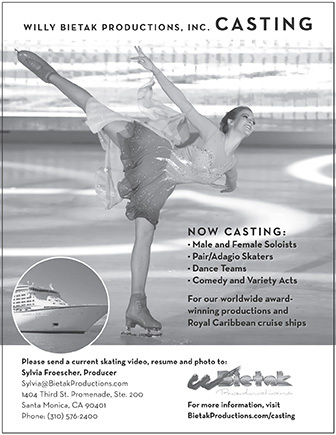 Choreographed by former British ice dance champion John Kerr, Sylvia Fontana (former Italian champion), and John Zimmerman (former U.S. pairs champion), the routine is a major departure for a pairs team. When Savchenko’s partner of more than a decade, Robin Szolkowy, decided to retire in 2014, she realized she was not yet ready to hang up her competitive skates. Massot had been partnered with Daria Popova, a former Russian pairs skater who relocated to France since 2011. When he was approached by Savchenko and her coach Into Steuer, Massot jumped at the opportunity to compete with the iconic Savchenko. The duo officially teamed up following the 2014 World Championships and have been working hard to find common ground with technique and style. As of today, they are not eligible to compete internationally given citizenship issues and ISU rules, which require a one-year absence from any ISU competitions. France has not yet released Massot but the duo is hopeful it will soon provide the necessary release for Massot so that they can represent Germany on the global stages.